Jalen Hurts lost his job to Tua Tagovailoa at Alabama, and will take over for Kyler Murray. He respected how the Alabama quarterback, who lost his starting job to Tua Tagovailoa, put the team above his pride. Hurts could have transferred right after Alabama went another direction, as so many quarterbacks do these days. Instead, he stuck it out and delivered a moment for the ages. 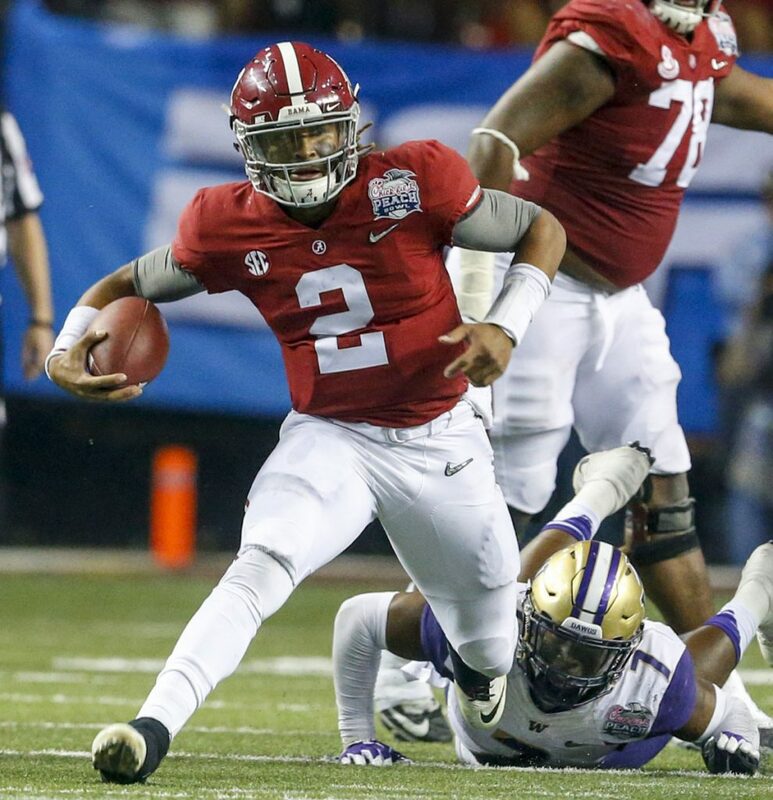 After Tagovailoa went down with an injured ankle during the SEC title game against Georgia, Hurts rallied the Crimson Tide to victory. • Quarterback Tate Martell says he is transferring from Ohio State to Miami. • Notre Dame quarterback Brandon Wimbush announced he is transferring to UCF. Wimbush is expected to compete with Darriel Mack Jr. for the starting job as back-to-back American Athletic Conference Offensive Player of the Year McKenzie Milton recovers from a severe leg injury. MICHIGAN: The father of a seventh grader in Michigan said his son has a scholarship offer from Jim Harbaugh and the Wolverines. Brian Marshall said Harbaugh made the offer after watching film of his son, Isaiah, who plays quarterback. He said he tries to keep his son grounded, and believes the offer will motivate Isaiah even more. MARYLAND: Scottie Montgomery, the former East Carolina head coach, will be the Terps’ offensive coordinator, according to several people with knowledge of the agreement. In addition to Montgomery, Penn offensive coordinator John Reagan will be the offensive line coach, and Mike Miller, who worked at Alabama as a graduate assistant, will coach tight ends. UCONN: UConn has hired Lou Spanos, a coach with experience in both college football and the NFL, to fix its historically bad defense. Coach Randy Edsall announced that Spanos has been hired as defensive coordinator, replacing Billy Crocker, who was fired after the Huskies’ 1-11 season. CLEMSON: After dining on fast food during their visit to the White House, the Clemson Tigers have been invited to eat at some of Chicago’s most acclaimed restaurants.